Low grade metamorphism. Determination of the tectonic setting of ultramafic and mafic igneous rocks in orogenic belts. Determination of tectonothermal history of orogenic belts . Dating of brittle deformation events. © 2016. The Early Palaeozoic proto-Pacific Pacific margin of Gondwana was characterised by a huge turbidite submarine fan with abundant clastic detritus derived from unknown sources within Gondwana. These deposits are widespread in the Lachlan Orogen of southeast Australia and include the Ordovician Adaminaby Group. Here we show that the mudstones and sandstones of the Adaminaby Group have chemical compositions that indicate the detritus in them was derived from a felsic, continental source similar in composition to Post Archean Australian Shales (PAAS). Chondrite normalised REE patterns showing LREE enrichment, flat PAAS normalised patterns and elemental ratios La/Sc, Cr/Th, Cr/V, Th/Sc and Th/U, have been used to support this interpretation. The dominance of quartz, and to a lesser degree plagioclase and biotite in the sandstones, suggests that the source was mainly granodioritic to tonalitic in composition. Th/Yb and Ta/Yb ratios indicate that the source was probably calc-alkaline, continental and shoshonitic. In addition, the presence of detrital muscovite, low-grade metamorphic and felsic volcanic clasts, demonstrates that a low-grade metamorphic terrane and volcanic arc contributed to the detritus observed in the samples. The presence of well-rounded zircons and tourmalines, very high Zr contents, high Zr/Sc and higher Cr/V ratios in some samples particularly in the Shoalhaven River area, indicate that some of the detritus was recycled.SiO2 versus (Al2O3 + K2O + Na2O) plots suggest the source areas experienced conditions varying from humid/semi-humid to semi-arid. Textural features and weathering trends of samples from all locations follow a curved pathway on Al2O3 - (CaO* + Na2O) - K2O (ACNK) diagrams, and indicate that the clays formed from weathering had been K-metasomatised prior to penetrative deformation. Chemical indices of alteration (CIA) reveal that even the freshest sandstones are altered and others are moderately to strongly altered. Discrimination diagrams involving major, trace and REE strongly support a collisional/continental volcanic arc setting that was substantially eroded to produce the plutonic detritus observed in the sandstones. The collisional setting accords with that proposed previously by other authors who suggested that it developed during the Delamerian Orogeny, resulting in the uplifted source areas providing detritus that inundated the backarc and forearc sites of the Macquarie Arc. Some of the detritus, however, may have been derived from a continental arc that existed in the late Cambrian along the margin of the Ross Orogen. Based on palaeocurrent analyses in previous studies and shoshonitic signature of the detritus, it is proposed that the Cambrian volcanics along the eastern active margin of Gondwana provided much of the detritus in the Adaminaby Group. Zircons with the Grenvillian signature suggest that some detritus were also derived from the Ross Orogen. © 2016 Geological Society of Australia. Brittle failure is common in the Devonian to Permian rocks in the Northern Hastings Block (NHB) and is manifested by faults of different orientation and kinematic histories, but the timing of fault movement is not well defined. In this study, faults in the NHB were analysed with the map pattern of cross-cutting faults used to estimate the relative time of movement and relationship to other faults. We defined five episodes of faulting or fault reactivation that affected the NHB. The Yarras Fault System on the southwestern side of the NHB and the Parrabel Fault and related faults on the eastern side of the NHB are the two major fault systems responsible for transporting and rotating the NHB in the late Carboniferous. Faults on the eastern, northeastern and northern part of Parrabel Dome started and stopped moving after emplacement of the Hastings Block and before the intrusion of the Werrikimbe Triassic granitoids. We suggested that the movement on the major bounding faults is related to the accommodation of the NHB to the folding and cleavage development in the adjoining Nambucca Block, and is associated with the earliest part of the Hunter¿Bowen Orogeny. Limited dextral movement on the extensions of the Taylors Arm Fault System caused minor displacements in the northeastern part of the NHB during the Late Triassic. Some small faults cut the Triassic granitoids or Triassic Lorne Basin sediments indicating tectonic activity continued post-Triassic. © 2014, © 2014 Geological Society of Australia. The Cambrian¿Ordovician Wagonga Group contains basalts at Melville Point and Barlings Beach, 20¿km south of Batemans Bay, New South Wales. At Melville Point, the succession has basal altered basalts overlain by chert and interbedded siliceous mudstone of the Wagonga Group, in turn overlain by turbidites and chert of the Adaminaby Group with a latest Cambrian to earliest Ordovician age. By contrast, at Barlings Beach, basalt is associated with highly disrupted chert (tectonic mélange), various slivers of mudstone and turbidites, and turbidites of the Adaminaby Group. Immobile elements in the basalts show consistent patterns that allow the magmatic affinity and tectonic setting to be determined in spite of pervasive hydrothermal alteration and subsequent lower greenschist facies metamorphism that accompanied strong folding and multiple foliation development. The Melville Point basalts show Ti/V ratios transitional between arc and MORB and therefore may have formed in either a forearc or backarc basin setting. However, these rocks have higher Ti/V ratios, LREE, Th and Nb than found in forearc basalts and are therefore considered to have formed in a backarc basin setting. 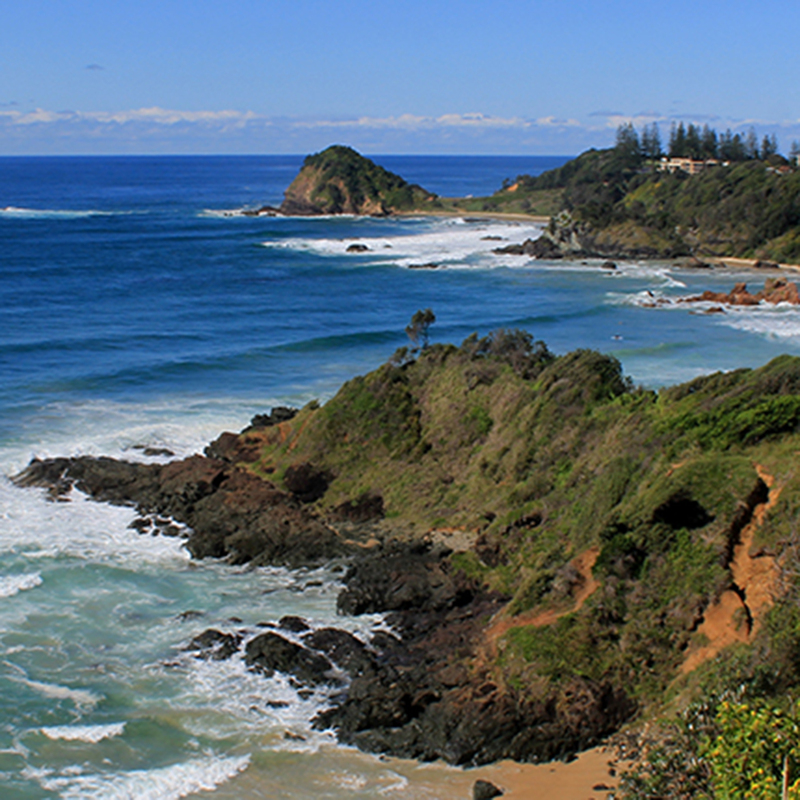 In contrast to Melville Point, most basalts at Barlings Beach have a geochemical signature distinctive of ocean island settings like those reported from elsewhere in the Wagonga Group. We believe these rocks developed in a Cambrian backarc basin setting. In the Early to Middle Ordovician, much of the ocean basin was inundated by quartzose turbidites followed by basin destruction with accretion/underplating at a Late Ordovician¿early Silurian Benambran subduction zone and formation of the Narooma Accretionary Complex. © 2015. American Geophysical Union. All Rights Reserved. New geochemical, metamorphic, and isotopic data are presented from high-pressure metamorphic rocks in the southern New England Orogen (eastern Australia). Conventional and optimal thermobarometry are augmented by U-Pb zircon and 40Ar/39Ar phengite dating to define pressure-temperature-time (P-T-t) histories for the rocks. The P-T-t histories are compared with competing geodynamic models for the Tasmanides, which can be summarized as (i) a retreating orogen model, the Tasmanides formed above a continuous, west dipping, and eastward retreating subduction zone, and (ii) a punctuated orogen model, the Tasmanides formed by several arc accretion, subduction flip, and/or transference events. Whereas both scenarios are potentially supported by the new data, an overlap between the timing of metamorphic recrystallization and key stages of Tasmanides evolution favors a relationship between a single, long-lived subduction zone and the formation, exhumation, and exposure of the high-pressure rocks. By comparison with the retreating orogen model, the following links with the P-T-t histories emerge: (i) exhumation and underplating of oceanic eclogite during the Delamerian Orogeny, (ii) recrystallization of underplated and exhuming high-pressure rocks at amphibolite facies conditions coeval with a period of rollback, and (iii) selective recrystallization of high-pressure rocks at blueschist facies conditions, reflecting metamorphism in a cooled subduction zone. The retreating orogen model can also account for the anomalous location of the Cambrian-Ordovician high-pressure rocks in the Devonian-Carboniferous New England Orogen, where sequential rollback cycles detached and translated parts of the leading edge of the overriding plate to the next, younger orogenic cycle. Structural and K-Ar dating studies of gouge in N-S, NNE and E-W-trending faults in four locations in the Sydney-Hunter region are reported. The fault zones are manifest as joint swarms and highly brecciated zones containing gouge with authigenic illite produced as a result of fluid infiltration. Strike-slip movement accompanied by minor dip-slip, normal movement occurred on the NNE faults, with dip slip on N-S and E-W-trending faults. In this study, gouge from a NE-trending, steep, SE-dipping fault showing dip-slip movement at Cut 10, on the Hunter Expressway and from an E-W-trending, steep south-dipping, normal fault at the Westside Open Cut, Lake Macquarie have been analysed. K-Ar dating of illite and illite-smectite in fractions extracted from fault gouges in areas unaffected by a thermal overprint reveals ages varying from 166 to 119 Ma for the <2 µm and finer fractions, and a mean age of ca 120 Ma for the <0.4 µm fraction. In the Sydney area and the Westside Open Cut coal mine, Lake Macquarie, the ages obtained from similar size fractions both for the gouge and for the host rocks are younger (134-76 Ma; av. <0.4 µm = 111 Ma). The data indicate influence of a thermal overprint associated with subsurface magmas emplaced during the early stages of the rifting of eastern Gondwana during the early Cretaceous. © 2014 © 2014 Geological Society of Australia. Clinopyroxenes as phenocrysts and in the groundmass of these altered basalts and basaltic andesites are considered to have crystallized at moderate (5-6 kbar) and falling P at T = or >900o-1000oC. Probe analyses show that they have a restricted compositional range and minor Fe enrichment from core to rim. It is suggested that they crystallized under hydrous conditions, with rising fO2 resulting in a Fe-Ti oxide appearing as a primary phase. -R.A.H. The Mesozoic-Cainozoic volcanic rocks of the Andes exhibit spilite-keratophyre alteration due to a combination of burial and hydrothermal metamorphism rather than contact metamorphism. Highest-grade assemblages occur in the basal parts of volcanic-deposition cycles formed by coupled subsidence and subduction. Metamorphic mineralogy for Peruvian volcanics is tabulated and 55 probe analyses are presented. The highest intensity of burial metamorphism in the Casma group reflects high geothermal gradients during aborted formation of a marginal basin. Comparison is made with central Chile and Patagonia, where metamorphism is characterized by lower geothermal gradients and mantle diapirism, respectively.-R.J.P. For 80 slates and phyllites of late Silurian-early Carboniferous age in this area in the NE portion of the Lachlan fold belt, W of Sydney, illite crystallinity values vary from 0.40 DELTA o 2theta (CuKalpha ) on the Molong anticlinorium to 0.12 DELTA o 2theta within the axis of the synclinorium, suggesting anchizonal to epizonal metamorphic conditions. This is in agreement with previous observations of a change from prehnite-pumpellyite facies (in the anticlinoria adjacent to the synclinorium) to middle greenschist facies in the axis (M.A. 69-2599). The mean b value from the pelitic rocks is 9.017 A, in close agreement with that for the adjacent Capertree anticlinorium. Statistical tests indicate two b populations in the Hill End synclinorium (9.010 and 9.022 A) with the lower values concentrated in the S portion of the structure; the higher geothermal gradient indicated by the lower b values is attributed to the presence of granitic intrusions at shallower depths than elsewhere in the synclinorium.-R.A.H. The stratiform and vein-type pyritic Ag-Pb-Zn-Cu sulphide deposits of Sunny Corner, NSW, are hosted by acid volcanic and clastic sedimentary rocks of Middle Silurian to early Devonian age. The rocks have been subjected to low-grade regional metamorphism (prehnite-pumpellyite facies) and three phases of folding and four faulting events are recognized. Pyrite is intensely fractured, indicating brittle deformation. Chalcopyrite and galena exhibit deformation twins and slip planes indicating ductile deformation; sphalerite and chalcopyrite show straight and curved grain boundaries and dihedral angles of 120o as evidence of annealing recrystallization. Sulphur isotope ratios for 22 samples from five deposits range from 1.7 to 10.7per mille and average 7.4per mille. Sulphur isotope data are similar to those from other stratiform sulphide deposits in acid volcanic rocks of late Silurian age in the E Lachlan Fold Belt, especially Woodlawn and Captains Flat, and together with other features of the mineralization, suggest a volcanic exhalative origin for the Sunny Corner deposits.-H.K.H. Sub-greenschist-facies metamorphism has produced unusual Fe-rich, actinolitic amphiboles in metadolerites in this area approx 300 km N of Sydney. Microprobe analyses show edenite, riebeckite, ferritschermakite and Ti-tschermakite coupled substitutions. Their high Fe content is attributed to high a Fe 2+ and a Fe 3+ in the fluid phase produced during the breakdown of clinopyroxene, hornblende, magnetite and ilmenite; the high a Fe 2+ led to Fe 2+ occupying the B site, resulting in production of sub-calcic amphiboles.-R.A.H. In many sedimentary rocks, small quantities of plant fragments (phytoclasts) are present. During prograde metamorphism, they undergo coalification and graphitiza-tion concomitant with the recrystallization of the inorganic detritus. The degree of coalification, or rank, can be quantified by measuring the reflectance of the phytoclasts. Measurement of this optical parameter has been applied mainly to rank-variation analyses in sedimentary basins and, to a lesser degree, to oil and gas exploration, stratigraphical and structural problems, and to contact and burial metamorphic rocks as an indicator of rank. In this paper, the potential of reflectance studies of phytoclasts in metamorphic rocks, is further developed. It is shown that phytoclast reflectivity is a more sensitive indicator of thermal perturbations than are silicate minerals, and that it is a useful indicator of grade in areas where index minerals are not developed. Furthermore, examples are given showing that isorank lines delineated from reflectance data reveal, on a regional scale, a metamorphic imprint similar to that of the silicate assemblages, and that metamorphic variables other than pressure and temperature may be involved in metamorphic reactions. © 1976 Taylor & Francis Group, LLC. More than 460 million years of history will be accessible for the community to explore when the Port Macquarie Coastal Geotrail, a collaborative project led by University of Newcastle researchers, is unveiled today.